I recently ate dinner at BurgerFi in Downtown Delray Beach. This fast food burger chain reminded me of a modern version of Five Guys with a better menu. I had a strawberry milkshake as my drink. It came topped with whipped cream and sprinkles. For almost $5, I thought it was somewhat expensive for the size cup the milkshake was served it. Tasted good though. Fries and onion rings. The onion rings were good, but the fries were very average. I had a Chicago Style Chicken Apple Sausage. The sausage was served on a poppy seed bun, topped with tomato, onions, relish, peppers, and a pickle slice. BurgerFi was generous with the toppings, but I was expecting something a little different with the sausage itself. I couldn't detect any sort of apple flavor and the sausage tasted like a normal hot dog to me. Overall, the food was pretty average at BurgerFi. I wouldn't purposefully rush back any time soon, but it definitely was better than Five Guys (I don't get the appeal of that place) and other similar burger chains. I wasn't impressed the first time I was here. I ordered the Meatball Pho and the broth was very bland. The beef broth in pho is normally really flavorful, but in this case I had to add lots of condiments to give it some more taste. The meatballs weren't much better, tasting much better after being dipped in some hoisin or sriracha. For a restaurant that claimed to be award winning, I was disappointed. A few months later, I decided to give Anh Hong another try. I forget the exact name of the dish that I ordered, but according to some of the online menus I found, I had the Cho Lon Combo. This was a big bowl of egg noodles, topped with shrimp, squid, crab meat, roast pork, assorted greens, jalapenos, and lime slices. A bowl of broth was served on the side. I'm not sure the proper eating technique of getting the broth on the side like this, but I ended up pouring it over everything in my larger bowl. Unlike my first soupy experience at Anh Hong, the food tasted much better this time around. The broth had lots of flavor, the meats were cooked to perfection, and was overall good. Green Day Cafe is a healthy, eco-friendly fast food restaurant on Lee Road in Orlando in an old Taco Bell building. 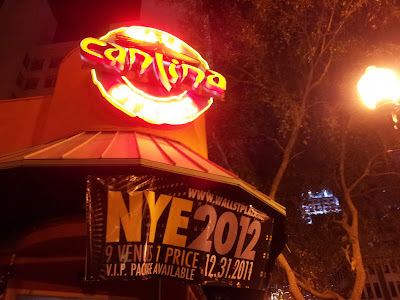 I was intrigued by the concept when I first heard about the restaurant but really didn't think they would last. Green Day Cafe is still open after a few years since I first noticed them, so I decided it was about time to taste their eco-friendly food. I had their 7-Layer Rice Bowl (Green Day Cafe is in a former Taco Bell building. My menu item of choice at Taco Bell is a 7-Layer Burrito, and I ordered a 7-Layer Rice Bowl here!). This large portion of brown rice was topped with black beans, colby jack cheese, guacamole, salsa, hummus, and buffalo sauce. While a couple of the ingredients didn't seem to go with the others (hummus), it still tasted good. The buffalo sauce/salsa gave the bowl a nice bit of spiciness and guacamole is good with everything. Who knows if this rice bowl was actually healthy by the time they put on all of the sauces, but I suppose it is definitely better for you than eating a burger. I'd return to Green Day Cafe. I read about Kingfish Bistro in an Orlando Weekly article. According to the article, they are apparently a Vietnamese owned Italian restaurant, and that combination intrigued me. Because of this, Kingfish was dinner last time I was in College Park. There wasn't really too much Vietnamese-Italian fusion food going on here. 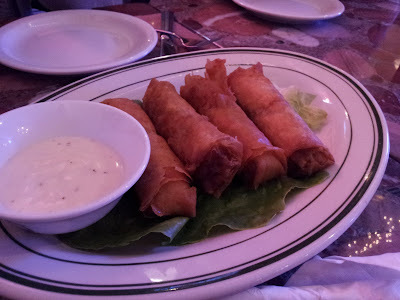 The majority of the menu seemed strictly Italian, except for several out of place items, such as these egg rolls that we had for an appetizer. We also decided to share a half meatball, half cheese pizza. The pizza was good, although not great. It was comparable to most of the other nearby pizzerias which are all pretty much middle of the road and average in this neighborhood. 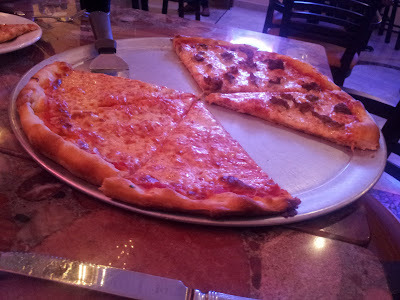 I'd have Kingfish's pizza again if I was eating there, but I wouldn't seek it out to fulfill any sort of pizza cravings. Overall, the food at Kingfish Bistro was good, although not great. I liked the egg rolls as a prelude to pizza, but I really would have liked to see more culture-clashing fusion foods here. Asian vegetables on pizza? I could see it! I like to consider myself well traveled throughout the state of Florida, but one city that I had never been to was Delray Beach. For some reason I always went further north or south of Delray and never actually stopped to explore rather than driving through. On a recent morning, I decided to change that and was actually surprised by Delray. The city's downtown was much larger than I was expecting, filled with shops, historic hotels, and countless restaurants. The decision was made to have breakfast at one of these restaurants called the Green Owl. The Green Owl had a sort of a retro diner look on the inside and outdoor seating on the sidewalk out front. We choose to eat outdoors. For food, I had the One Egg Special. This breakfast came with a scrambled egg, strip of bacon, and two pancakes. Everything on the plate was tasty, although I would have preferred actual butter for my pancakes rather than the margarine that was served. Real butter is always better! 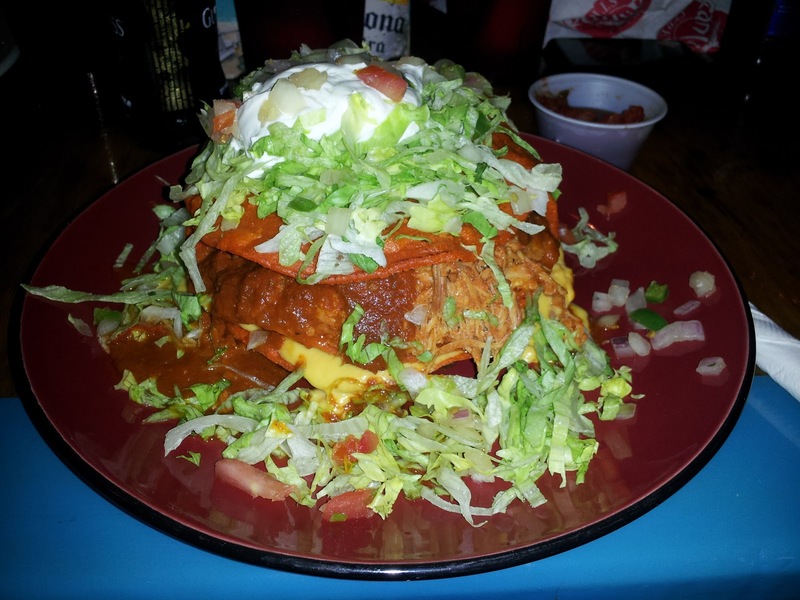 Wall Street in Downtown Orlando: It is a short block of bars and restaurants, many with the same owner, and most not worth visiting for the food based on my experience. 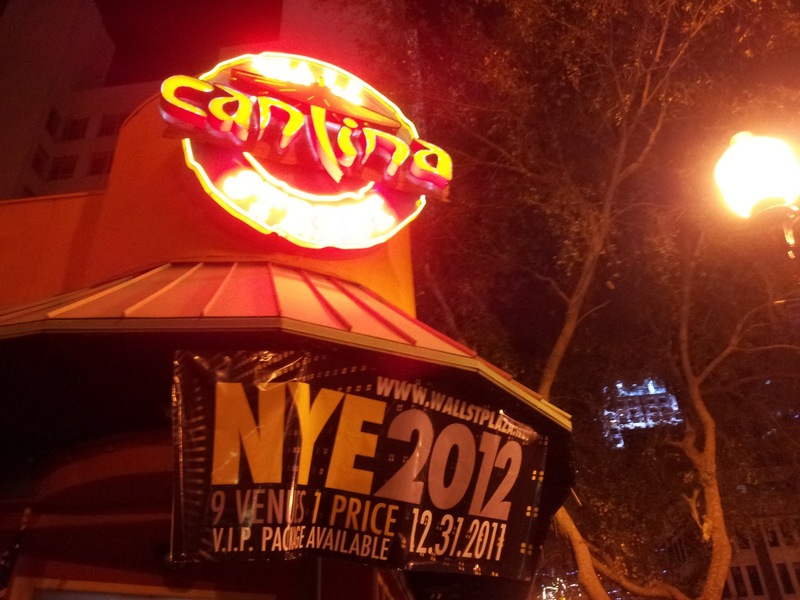 On a recent cold night, I had dinner at one of these bars/restaurants called the Wall Street Cantina.